Word lets you easily transform your document into an interactive and easy-to-share Sway web page that looks great on any device. 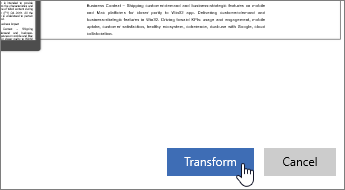 On the File tab, go to Transform > Transform to Web Page. Scroll the Style thumbnails and pick one you like. The Preview updates to show you how your document will look as a Sway web page, on a full size monitor and on a phone (Sway web pages are designed to look great on any device). A﻿fter your Sway web page is created, use the Share button near the top of the screen to get a link you can send out, or simply copy and paste the URL from the address bar. Who can see my Sway web page? Sways you create from your Microsoft account can be shared with anyone. Whoever you send a link to can view the page. Note: In Word Online, Sways can't be created from your personal Microsoft account, only from your work or school account. Sways you create from your work or school account can be shared with anyone in your organization. The page is not visible outside your organization. After your Sway is created, you can change permission for who is allowed to see it. For more information, see Share your Sway. Can I edit my Sway web page after it's been created? Yes, you can. 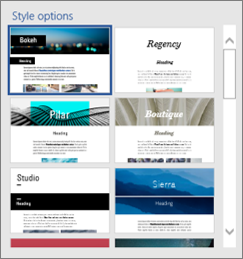 To get started, click the Edit button near the top of your Sway. How do I find my Sway web page later? All your Sways are at https://sway.office.com/my. Sway is a Microsoft Office app that makes it easy to create and share interactive reports, personal stories, presentations, and more. Learn more about Sway at Getting Started with Sway.